If you haven’t started any seeds yet and are lamenting the fact that because you’ve procrastinated you’ll have to spend more money and buy all your plants from a nursery, fear not… There are some seeds that sprout so quickly you still have time to start them inside before it’s open season. 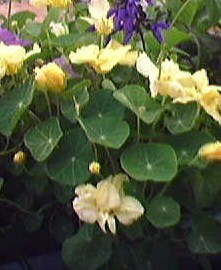 The two I most highly recommend are Nasturtium and Morning glory. And my Nasturtium sprouts weren’t far behind. Within a few short days they revealed themselves. So, even if you’ve dragged your feet, these fast starters will make up the distance. Hi Avis, the Nasturtium leaves, do you need to cook them beforehand? Or it can be included into salad? And yes, growing from seed is so much cheaper 🙂 Btw, how long can you keep the seeds? Could the balanced be kept for next year? Have a great day! Oh, and I have kept seeds until the following year, mainly because I sometimes buy too many and wind up not planting them all. I can say for sure that it’s worked out just fine for me. But, I’ve read some seeds don’t keep as long as others, so you should probably do a little research on the specific seed you plan on hanging on to.